Since its establishment in 2007, the Miami Gardens Police Department has worked to protect and serve the 110,000 residents of Miami Gardens, Florida. The department currently employs a total of 259 members, including 201 sworn officers and 58 non-sworn support personnel. Placing a strong focus on community interaction, the Miami Gardens Police Department is committed to working cooperatively with residents to build a safer city. The Miami Gardens Real Time Crime Center team. In 2015, the Miami Gardens Police Department met with city officials to discuss strategies for reducing crime in the community. The police department was eager to enhance its operations with new high-tech crime monitoring software, but its facilities lacked the display technology that would be needed to leverage these tools. Together with city officials, the police department proposed the creation of a new Real Time Crime Center: a high-tech facility equipped with a powerful video wall system where the latest policing tools could be displayed and monitored. The residents of Miami Gardens approved the proposal, agreeing to fund the facility through the city’s $60 million general obligation bond. As planning for the Real Time Crime Center (RTCC) got underway, the City of Miami Gardens began evaluating vendors for the facility’s video wall solution. After a brief bidding process, the project was awarded to CineMassive. “We needed a company that could deliver a complete system,” explained Miami Gardens Sergeant Erik Gleason. CineMassive’s ability to design and deliver a turn-key solution—including video walls, a video wall controller, and software—was a major advantage. Over the months that followed, CineMassive would work closely with the police department and city officials to deliver a purpose-built video wall solution for the Real Time Crime Center. Inside the Miami Gardens Real Time Crime Center. Completed in August 2016, the Real Time Crime Center features two main spaces: a large control room for day-to-day operations and a Joint Operations Center (JOC) for collaboration with federal agencies. The two rooms are connected by a turn-key CineMassive visualization system featuring four high-resolution video walls and several auxiliary displays. In the facility’s main control room, three bright CineView LCD video walls display an arrangement of camera feeds and real-time policing tools. Built in configurations of 6×2, 5×2, and 4×2 displays, the video walls feature ultra-narrow bezels, creating a seamless effect. In the adjacent Joint Operations Center, a smaller 2×2 video wall and two auxiliary displays are mounted above a conference table. Three additional rooms on the next floor—the police chief’s office, police chief’s conference room, and assistant police chief’s office – are also equipped with auxiliary displays, providing the officials with a real-time view of activity on the video wall system. Seated at workstations in the RTCC control room, a team of officers, detectives, and crime analysts study the content on the video walls. As part of their daily operations, the team monitors video analytics programs, license plate scanners, television news, and ShotSpotter, a real-time gunfire detection solution that maps the location of shots fired in the city. They also use Live Earth, a digital PSIM platform that pulls real-time data from emergency calls, surveillance applications, and more into a live, 3D map of the city. A CineMassive Alpha video wall controller allows all of these tools and applications to be displayed on the video wall system simultaneously. By uniting their data sources in a single view, analysts can visualize crime hotspots, identify connections between crimes, and contextualize incidents within larger trends. When an incident occurs, the team uses CineNet video wall software to display and manage the tools they need on the video wall—from surveillance cameras to criminal databases. With CineNet, operators can load pre-arranged layouts of applications, zoom in on selected camera feeds, and dynamically pull in new content sources as needed. The user-friendly software helps them gather intelligence quickly so they can provide responding officers with critical insights. “With CineNet, we’re able to easily control any video feed or data source on the video wall from any of our monitors,” Sergeant Gleason explains. 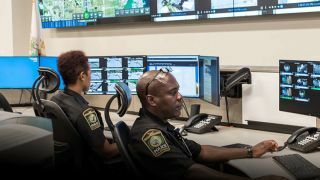 The Real Time Crime Center and its CineMassive visualization system have transformed the way the Miami Gardens Police Department fights crime. Armed with a deeper understanding of crime in the community, the department can now identify crime trends and hotspots, use its resources more effectively, and work faster and safer to intercept criminals.